Who were the stand-out performers from Sunday's Chinese Grand Prix? We look over the field in our driver ratings. As Lewis Hamilton hit 75 career victories, this one will go in the ‘ordinary’ pile. It was a fuss-free, straightforward victory for the Briton, who after passing Valtteri Bottas at the start never looked like losing the race. To have bounced back from struggles with the car throughout practice (and even the early stages of qualifying) and win with such ease speaks volumes about Hamilton’s champion quality. After disappearing in Bahrain, ‘Bottas 2.0’ returned on Saturday in China as the Finn swept to a brilliant pole position. But he downgraded again – perhaps to Bottas 1.5 – in the race, with a poor start costing him the lead to Hamilton. Bottas had the pace to keep the Ferraris far behind, but never got close enough to fight with his teammate. Plenty of hubbub over team orders after the race, but don’t let that detract from a decent display from Vettel, who really did the most he could. He lost a place to Charles Leclerc at the start after getting stuck behind Bottas, who had a poor getaway, and by the time the call came to pass his teammate, his tyres were already past their best. Some bold defence kept Max Verstappen behind before pulling clear through the remainder of the race to pick up his first podium of the year. P5 may seem massively disappointing for Charles Leclerc, but none of that is on him. Ferrari’s muddled strategy calls following the on-track switch of position meant he had little chance of catching either Vettel or Verstappen ahead, not did the team even go for the fastest lap. A shame for a driver who matched his esteemed teammate every step of the way in Shanghai, even despite some issues on Friday. It’s astonishing that Max Verstappen sits ahead of both Ferrari drivers in the championship after three races this year. But just as he did in Australia and Bahrain, the Dutchman capitalised on the opportunity that arose in China, jumping Leclerc and putting pressure on Vettel after Ferrari’s team orders call. He didn’t have the outright pace to race the Ferraris, making P4 on a day he should not have been any higher than P5 a real achievement. A better race for Pierre Gasly, who finally had a clean qualifying en route to sixth place on the grid. Despite a softer starting tyre than the cars ahead, Gasly could not keep up with the leading pack, with teammate Verstappen charging far ahead. He was comfortably clear of the midfield squabble, though, allowing him to pit late on and score his first fastest lap in F1, as well as the bonus point with it. There’s still a big gap to Verstappen, but this should be a good confidence boost. Another man in need of a confidence boost after a rough start with his new team, Daniel Ricciardo finally got on the board for Renault with a foot-perfect drive in China. P7 in qualifying was followed by an easy run to the same position in the race as he pulled off a one-stop strategy work. Late pressure from Sergio Perez surprised Ricciardo, but he was able to eke open the gap again to finish a couple of seconds up the road. Reliability continues to be Renault’s weakness in the early part of the season, with Nico Hulkenberg being sidelined for the second race in a row by an MGU-K issue. Hulkenberg qualified just 0.004 seconds behind teammate Ricciardo, but dropped a couple of places after a poor start. An early stop to try and get the undercut was soon followed by a loss of power, ultimately leading to his retirement. The same story for Haas as in Bahrain: brilliant in qualifying, nowhere in the race. Magnussen failed to get a time in Q3 after missing the flag – he brushed it off – but slipped back in the race as Haas struggled with its tyres yet again. Eight seconds down on teammate Romain Grosjean at the flag, Magnussen will be for answers about Haas’ Sunday woes ahead of the next race. Grosjean was in the same boat as Magnussen in China, but was more on top of things in the race. A final 16-lap sprint on fresh Mediums put Grosjean in the hunt for points late on as he closed on the one-stopping Alexander Albon, but he could not open his account for F1 2019 as blue flags forced him to ease off. A good performance all things considered, though. A hard race to judge for Sainz following his first-lap contact with Daniil Kvyat that left him in need of a pit stop for a new front wing, but the Spaniard was able to fight back well after that, even while almost running a lap down. The race pace was good for the McLaren MCL34 once again, leaving him just 20 seconds off the points. Encouraging signs from a day that could easily have been written off. 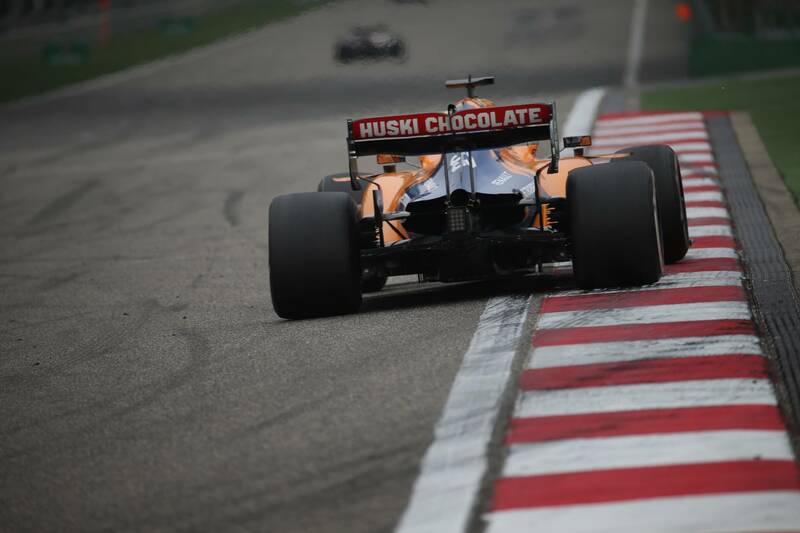 Lando Norris said on Saturday that McLaren was in a more realistic position after failing to make it through to Q3, having qualified 15th, but his hopes of fighting back into the points were dashed after the contact with Kvyat. Running plum last behind Sainz and with floor damage, Norris’ race became an extended test session, with a fourth and final pit stop late on being a call to retire from the race. One of the drives of the day in China came from Sergio Perez, even if it was pretty under the radar. A flying start saw him jump from P12 to P8 on the opening lap before sitting firm in the position and making a one-stop strategy work. Kimi Raikkonen got close at one stage, but Perez pulled clear and almost caught Ricciardo in P7 before the end. A really good drive that surprised many. A seventh straight Q1 exit for Stroll left him hoping for a fightback in the race that, at one stage, looked on. A good start left him 13th and ahead of Albon, who got the undercut at the first stop. Stroll stuck with Albon for much of the race, but could not keep his tyres alive, prompting Racing Point to call him in for a second stop in the closing stages that meant P12 was all he could manage at the flag. Kimi Raikkonen continued to lead Alfa Romeo’s charge this year with his third straight points finish, this time fighting back from a disappointing Q2 exit that left him 13th on the grid. Raikkonen picked up some places early on, and tried bridging the gap to Ricciardo and Perez ahead by going for a longer first stint. Fresher tyres allowed him to close up on Perez in the second stint, but Raikkonen could not keep them alive, leaving him to settle for ninth. Still a decent result. Giovinazzi arrived in China saying he just want a “clean” weekend, but was left hamstrung by recurring power unit issues. He managed just two laps in FP1 and then sat out qualifying due to a control electronics problem to leave him at the back of the grid. Alfa Romeo rolled the dice on strategy with a bold two-stop approach, but Giovinazzi couldn’t keep pace with the points scorers as he slumped to 15th. Voted Driver of the Day at only his third grand prix, Alexander Albon put on a real show in China as he charged from the pit lane to the points. His FP3 crash ruled him out of qualifying, but Albon made up plenty of places early on before nailing his one-stop strategy to nick a point for P10, keeping Grosjean at bay in the final few laps. He’s docked a point in our ratings because of the FP3 crash, but still deserves plenty of credit and respect for a brilliant fightback. A tough break for Kvyat on a weekend where he looked in contention for points after qualifying 11th. After getting caught in the McLaren sandwich, he was harshly penalised with a drive-through penalty for allegedly causing the collision. Kvyat was pleased with his pace thereafter, even rising as high as P10 at one point, but ultimately retired due to damage from the clash. George Russell led Williams’ charge yet again in China, taking a third successive qualifying and race victory over teammate Robert Kubica. Good pace early on allowed him to dice in the midfield battle a bit before the race settled down. Russell struggled through the middle stint and took a late final stop for tyres, meaning the 16-second gap to Kubica probably should have been bigger. Kubica joked that the most exciting part of his race was the spin on the formation lap, and he’s probably right. A one-stop strategy left him in a race of his own as he finished well adrift of his teammate, once again as the last car running.